Microsoft’s Skype for Business (formerly Microsoft Lync) is the Unified Communications platform of choice for many businesses around the world. 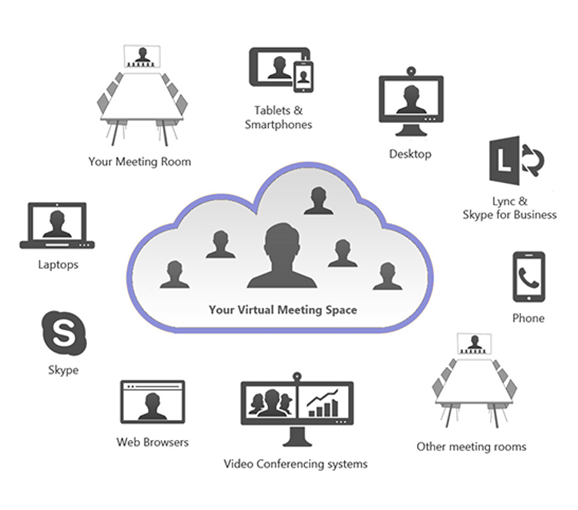 Used by many for ad-hoc conferencing, instant messaging and desktop collaboration, a Skype for Businessc on-premise platform takes design, planning & integration to successfully deploy into a network, and requires solutions, endpoints & accessories designed & optimised for the platform to work effectively & efficiently. Office 365 is a subscription service to the most up-to-date tools from Microsoft from the Cloud, and can include hosted Skype For Business, more suitable for those that do not require an enterprise setup or much customisation for their organisation. There are many collaboration solutions available for both on-premise Skype for Business and Office 365, depending upon what your organisation is looking to achieve. Deploy MS Skype for Business? Bring MS Skype for Business or Teams into the Boardroom? Enable your UC platform to communicate with professional room & mobile endpoints? Integrate your Cisco WebEx platform with Skype for Business? Connect your Microsoft Surface Hub with standards-based video? Improve audio & acoustics in your Microsoft based meeting space? Improve desktop audio & IP phones, and ensure all devices are optimized for Skype for Business? All-in-one video conferencing systems, designed specifically for Skype for Business. These systems include displays, touch panels, microphones & cameras, and can be tailored to your requirements dependent upon room size & screen size, audio requirements, control requirements and features. 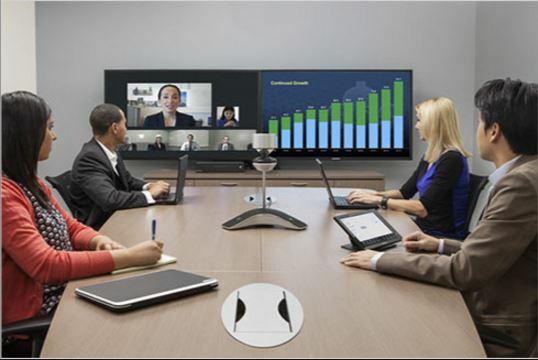 There are a number of options for dedicated Skype for Business room systems, including from Polycom, Crestron and Logitech, alongside the Microsoft Surface Hub. 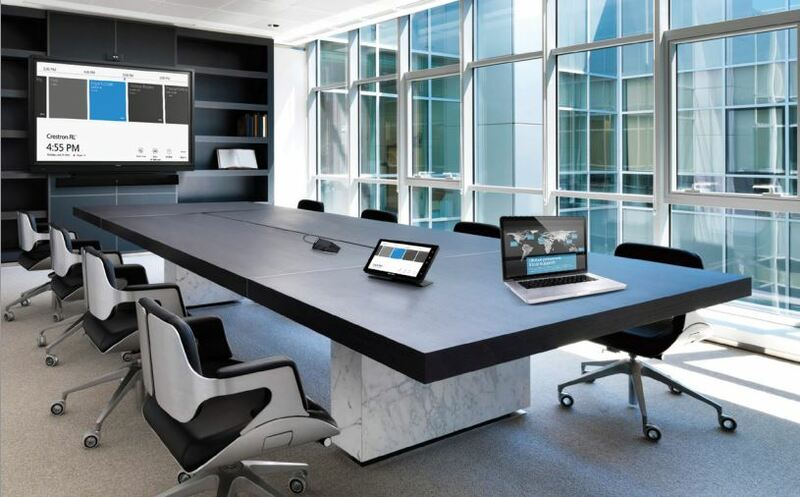 One of VideoCentric’s leading Skype for Business room systems is the Crestron RL2, which provides a S4B experience directly into the meeting room space. 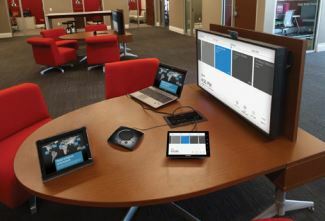 Offered in a range of designs and bundles including both for the huddle room and boardroom, the RL2 combines the Skype for Business software with Crestron hardware, with the additional benefits of Crestron control. Talk to us today to arrange a visit to Crestron’s HQ where you can see the RL2 in action and discuss your Skype for Business requirements with experts. For organisations that do not want to be islanded within the Microsoft world, a Skype for Business Interoperable solution provides the best of both worlds – connect with Skype for Business when needed, connect with the rest of the video communications world when you don’t. There are a number of solutions and endpoints that can be integrated with Skype for Business from many of the world’s leading Video Collaboration manufacturers, either directly or via a interoperable service. Certain systems, however, may require specific hardware, licenses, infrastructure or services to enable full compatibility or integration, so it is important to understand the difference between the whole range of solutions offered on the market today that claim compatibility with Microsoft solutions. Leading the way with Microsoft integration is surely Polycom (Plantronics) – VideoCentric already have the Polycom Group series, Polycom Trio, Polycom CX Series and Polycom infrastructure integrated with Microsoft Skype for Business in our own offices already today, and the roadmap for Polycom and Microsoft shows even more tighter integration on the way. 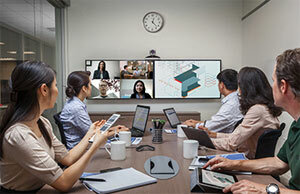 Polycom solutions such as Polycom RealConnect for Office 365 and Skype for Business enables professional Video Conferencing solutions with the Skype for Business video and content sharing experience, integrating with Outlook scheduling and providing the familiar S4B layout. Organisations can bring together Skype for Business users and any standards-based Video Conferencing systems seamlessly. There are also many solutions, accessories and services that can be combined to enable Skype for Business interoperability with the rest of the world. Many organisations have tried (and many failed) to simply escalate the desktop to the meeting room, resulting in poor video and even worse audio. To help our customers get this right without running over budget or implementing a poor quality solution that sees low adoption in the long run, our expert support teams have tested a full portfolio of devices optimised for Microsoft in the boardroom, put them through stringent interoperability tests, and have selected our favourites including specialised audio & echo cancellation microphones, soundbars, cameras and displays, control panels and services, to provide a much better solution than simply putting a PC in the meeting space connected to a screen, and hoping this will cut it. As Microsoft’s Skype for Business does not follow standards, and so does not directly communicate with other Video Conferencing, Audio Conferencing or Data Collaboration services deployed around the world, organisations wanting to communicate with other businesses and those outside of the Microsoft world may need to implement a solution to join these different standards together. If you’d like to discuss how Skype for Business can be integrated with your current video conferencing deployment, hear our recommendations for S4B/Microsoft Lync endpoints & accessories, or would like to trial a system for a meeting space, contact our team today. Need to test your environment? Want to see how it all comes together? Need a demonstration? VideoCentric have Microsoft Lync 2010, 2013, Skype for Business and Office 365 integrated in-house with Video Conferencing platforms including Polycom RealPresence, Lifesize Cloud, Zoom and Cisco VCS, and the VideoCloud 365 service, all of which can be trialed almost instantly, providing seamless interoperability with Skype for Business/Microsoft Lync and the rest of the video world. 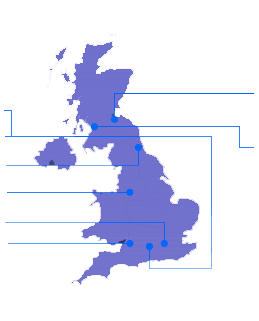 Whether through deployment of a new UC solution, or via the integration of your UC and video network islands, VideoCentric’s long-standing expert partnerships and accreditations with the world’s leading hardware vendors such as Cisco, Avaya, Polycom, Snom, Jabra and Plantronics, alongside the strategic partnerships in place between VideoCentric and Microsoft Expert Voice & Data partners, provide your organisation with everything you need to succeed in the world of Unified Communications.